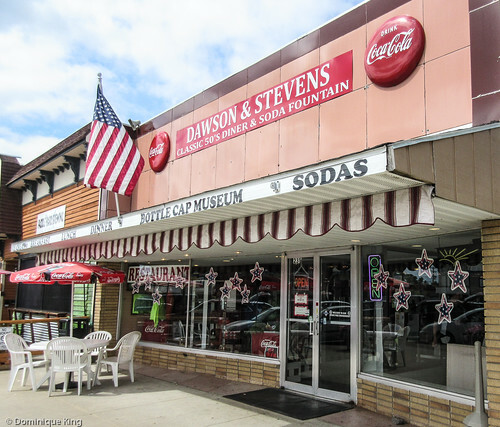 Dawson and Stevens in Grayling, Michigan proudly identifies itself as a "bottle cap museum", but it is more accurate to say that this 1950s-style diner is home to one of the largest private collections of Coca Cola memorabilia in northern Michigan. Collector Bill Hicks and his wife amassed an impressive collection of 7,000 items, one piece at a time, that included Coke branded advertising signs, key chains, metal trays, unique cans, glassware, toys and just about anything else you could imagine with the iconic soda pop's name and logo. The pair collected things over a period of three decades and established a small museum to house it and display it to the public. 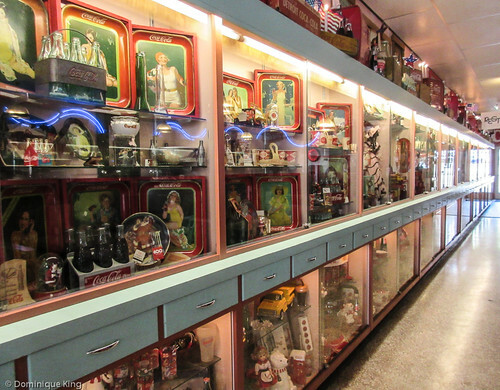 Hicks operated the museum in Sparr, Michigan (about 30 miles north of Grayling) for 11 years until the day that Grayling business owner and Coca Cola memorabilia enthusiast Bill Gannon stopped by with the idea of purchasing a couple of bottles. Gannon ended up purchasing the entire collection, using it to provide the decor and a theme for his then-newly remodeled diner in downtown Grayling. The diner got its start as a retail business with a soda fountain established by Earl Dawson in 1938. An electrical fire destroyed the building in 1957, but Dawsons stayed in the family, reopening a year later under the management of Devere Dawson and his wife Pauline. The duo ran it for five decades before selling it to Russell and James Stevens in 1994. The business became more of a restaurant during the Stevens' tenure, and they sold it to Gannon in 2004. Gannon, who owned Gannon broadcasting, was familiar with the local restaurant scene and history because he also owns Bear's Den Pizza right next door to the dinner. He is also familiar with the idea of using historic photos and memorabilia to create a fun restaurant theme as the Bear's Den houses a large collection of artifacts connected to legendary Grayling bow-hunter, Bow manufacturer, author, television host and archery enthusiast Fred Bear (the pizza there is pretty good, too!). Gannon has a real appreciation for the diner and its history, naming the restaurant Dawson and Stevens in a nod to the two families who established it and helped build it. 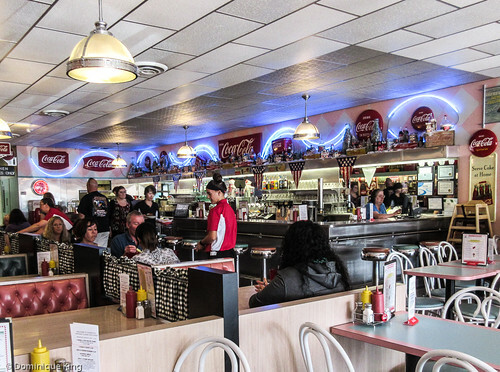 Gannon ran Dawson and Stevens for about a year before closing for a short while to remodel and expand the seating area to accommodate 110 diners and decorate the diner to reflect more of the feel and atmosphere of a 1950s-era soda fountain. Continuous 1950s music and a menu featuring soda fountain favorites like Boston Coolers (a Detroit original favorite featuring vanilla ice cream and Vernors Ginger Ale...there is no other ginger ale if you're a true Detroit-area native, by the way) and a menu of sandwiches and other meals named for classic 1950s and 1960s songs. Tim had a classic "Soldier Boy" Rueben for lunch, and I ordered a "Wipe Out", or turkey Rueben. 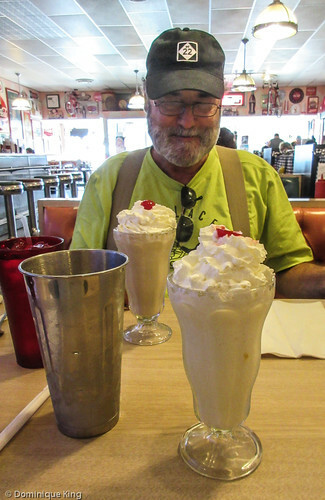 And no meal at a classic soda fountain would be complete unless accompanied by the aforementioned Boston Cooler and, Tim's choice, a Brown Cow (a soda fountain drink featuring root beer and vanilla ice cream). Gannon continues to add items to the Coca Cola memorabilia collection, bringing the collection today closer to 10,000 items. There is room to display about half of the collection at any given time, rotating items in and out of storage. The collection draws visitors from around the world and it's especially popular as a tour bus destination or venue for birthday party celebrations. There is no admission to see the collection at the restaurant, but Dawson and Stevens is open daily and we found it a fun for lunch (seriously, trying a Boston Cooler here is a must!). Curious about Vernors, its history or just can't get it where you live? Check out The Vernor's Story: From Gnomes to Now by Lawrence L. Rouch, Vernor's Ginger Ale (Images of American: Michigan) by Keith Wunderlich or just go ahead and get your own 12-pack of this quintessential Michigan pop! You can also connect with Dawson and Stevens on Facebook.